The best part about my freshman year in college was my roommate. She was a fellow Christian, and it was comforting knowing I could come back to my room after class and share my struggles with her. She could understand why I was so upset. She helped me gain perspective and showed me I was not the only Christian and conservative on campus, even though it felt like it at times. As we would walk to our separate classes together she encouraged me, confirming we knew the truth, that our ideas were valid, and that we were responsible to present the whole picture. Those days really made a difference before I walked into English class. I could hold my head higher. It would be difficult to overstate the importance of a solid, grounded Christian friend. Fortunately for my roommate, she didn’t seem to have drawn a class schedule featuring some of the far left academia nuts I was encountering. But she didn’t escape completely. As my roommate sat in freshman biology class the first week of school, the professor paced across the front of the class, turned and asked if anyone did not believe in evolution. If they did not, would they please raise their hands? My Christian roommate and another student both raised their hands. At a secular school, it certainly would be plausible that the majority of students adhere to the story of evolution. But it is even more plausible that there were other students who didn’t believe, or at least questioned some of the holes in the evolution theory, but were too scared to identify themselves. The two who did raise their hands became easy targets the rest of the semester. My roommate wasn’t intimidated and stood up for her convictions with that small gesture of raising her hand. With that simple act, she acknowledged that truth is more important than conformity. There were probably others in her class who thought the way she did, but they were too scared and intimidated to identify themselves. It’s easy to be bullied into silence. It happens a lot—even to mature Christians. The crowd listening to DeGenova nearly filled Columbia University’s Low Library. And the crowd was silent. If there were students who disagreed with DeGenova’s murderous comment, their voices were not heard. How is it possible in a crowd that size that not one person was utterly repulsed by DeGenova’s wish for a million Mogadishus? How can that be possible? How? Fear. There probably were at least a few who disagreed with DeGenova, but they were afraid to be heard. Fear is a powerful intimidator. That fear of being the loner in a crowd, whether it’s in a campus library or a classroom discussion, is nearly palpable. When the conversation slants markedly to the left and you realize you may be the only one leaning right, fear can be nearly paralyzing. Your heart quickens, you feel flushed, and you desperately hope there is just one other person in the room who will side with you. The fear grows so thick you can almost see it and smell it. What’s to fear? Plenty. The first thing to fear is a grade. I always wonder if speaking up is going to cost me academically. Does the professor have an appetite for vengeance? What will the cost be? A quiz grade, an unfair take on an essay question? Will speaking up mean a lower grade for the semester? How battered do I want my GPA to be? And to be quite honest, and borderline opportunistic, the chances I’m going to change a professor’s mind are probably zero to none, so is it worth the risk? I also fear a certain amount of rejection among my peers. My fellow classmates may hear what I have to say and unfairly label me close-minded, a bigot, intolerant, or a homophobe. A good deal of fear is generated by the professor because of his or her position of authority. The professor always has the upper hand—more experience, more wisdom, more letters behind the last name. The professor rules the class. If professors want to eat you for lunch, they can. They write the menu. In my freshman English class, the professor liked controversy. But since most of the students would either agree with him, or didn’t care to speak out, I became the one who most often held the opposing view. Contrary and argumentative—front row, second seat from the wall. The professor would present a typical left-wing, anti-Christian, I-hate-America topic in class, give his opinion on it, then pause to see if anyone would speak up. He would try to make eye contact with a student and frequently find that no one wanted to debate him. He’d then look at me to see if I would oblige. Evidently we’d developed something of a routine. Even if I didn’t want to engage in a debate, it somehow became a responsibility, sort of like an unwritten job description. By being called on repeatedly, this fear began to diminish somewhat, but there were still times when being singled out grew wearisome. My friend Angela was singled out in her speech class when she gave a speech on guns. Her position was conservative, in defense of gun ownership and the Second Amendment. During the in-class student evaluations, her classmates ripped her apart for, what they considered, her nutcase views. Student after student criticized her stance on the topic. Being a target can be very draining. Being a target and not having any backup support can be miserably disheartening. Later, Angela was talking to a friend that had been in that class with her. She found out that he had agreed with her stance on gun control. Since he didn’t speak up, Angela had assumed he held the same hostile opinion as the rest of the class. When Angela found out he had shared her views, she was deeply hurt. She felt he had betrayed her. The truth is, he had been paralyzed with fear. He saw the way the class reacted to Angela and he simply didn’t want to offer himself up as the next living sacrifice. So, he kept his mouth shut and his head low. But to this day, he deeply regrets not speaking up in class. Matt Kaufman relays a similar experience from the University of Illinois. Co-founder, along with some friends, of a conservative campus newspaper called the Illini Review, he was denounced as bigoted, sexist, and homophobic. “Departures from the party line generally bring an automatic response,” he writes. “Say that abortion kills children and you’re a patriarchal oppressor of women. Say that the theory of evolution is fatally flawed, and you’re a religious fanatic. Say that homosexuality is immoral—or just that it’s a treatable emotional disorder—and you’re a homophobic hatemonger. “None of these responses are actual arguments. They’re just curses. They’re not meant to describe or to analyze; they’re meant to stigmatize and to silence. “A prime motivator for failing to stand up for what’s right in your families, your schools and communities, and in your jobs is fear. It is amazing how powerful and paralyzing fear is, especially when it’s not specific. Paul wrote that as Christians our attitudes are not to be a spirit of fear. “For God has not given us a spirit of timidity, but of power and love and discipline,” 2 Timothy 1:7 . The more you take opportunities to speak out in class, the more you realize that intimidation is empty unless it stands on something firm. If professors wield the intimidation, but can’t back it up with pure and simple truth, there is no reason to fear. Fear may be the instinctive response, but it’s not how God wants us to live. 1 Peter 3:14 is quite specific about fear. Sitting silently when truth, liberty, free speech, and tenets of Christianity are attacked is the result of fear. I understand the fear, but I also understand the need for courage. Speaking up when you’d rather not is an act of courage. Courage isn’t the absence of fear, it’s acting in spite of fear. Courage puts your senses on alert, your brain in gear and a sparkle in your eye. It’s the excitement that comes from living with purpose, as opposed to going with the flow. You’re sitting there thinking someone should say something, somebody should try to stop this runaway train, and yet the words stay in your mouth. When that happens, ask yourself this: If not me, then who? C’mon. Speak up. Go Nike—Just do it. 2 Corinthians 10:15 says, “Our hope is that, as your faith continues to grow, our area of activity among you will grow greatly.” Part of growing in faith involves developing your own convictions. Having convictions means being willing to be uncomfortable for the sake of an idea or a principle. So wonderful to hear from you! I was hoping you would send a message my way. What can I possibly say to sum up the last 5 ½ weeks since I have left home? It was a great decision to go on the Wilderness trip that Wheaton offered 3 weeks before school started. I came back with the most amazing memories of trekking through the North Woods of Wisconsin and the Upper Peninsula of Michigan (our trip culminated on the banks of Lake Superior), established friendships with a wonderful core of friends, and two hours of class credit. We are now in our 3rd official week of classes. My professors are really dynamic. My Political Philosophy class is amazing and I love my British Lit class. I am taking 19 hours this semester. In reality, it is only 17 because I carried in those 2 credits from the Wilderness trip. The weather has been absolutely pristine. I have really begun to find a core group of friends that I enjoy. The spiritual and intellectual depth of the student body at large has blown me away. I find myself in conversations of depth many times throughout my day. I am really enjoying the friendships that I have been able to lay foundations for. Chapel has been wonderful. Last week, we had Allistair Begg here to do special services, and tonight there is going to be a debate between Gary Bauer and Tony Campolo that I am going to. It has also been great to have the city of Chicago right here. It is a 40-minute train ride in, and you can buy an all-weekend pass for nothing. I have gone into the city 3 times since being here. Over Labor Day weekend, a big group of us went in for Jazz Fest and had a great time sitting in the sun and listening to the sweet tunes of smooth jazz along the banks of Lake Michigan. I feel that this letter isn’t really satisfactory as it just gives you a sweeping generalization of my time here. I will send you more detailed accounts of the people I have met, the food fights I’ve had, etc. in the future. Tell me about how things are going for you. Hope to hear from you soon. Everyone in the class sang the chant except for Brooke. Brooke didn’t chant because she is a Christian. Chanting praise to Buddha was disturbing to her. As the class progressed, it was also disturbing to her to see other Christians in class chanting “Praise to Buddha,” then singing praise to God at Campus Crusade on Thursday nights. After the first class when Brooke declined to participate, the professor sternly lectured the class about students who don’t participate. The next class session he seemed to lighten up though and didn’t make a big deal out of Brooke not chanting. The class continued to chant at the beginning of each class period throughout the semester. Can you imagine what would have happened if the professor had passed out copies of the Doxology and asked the class to sing along? 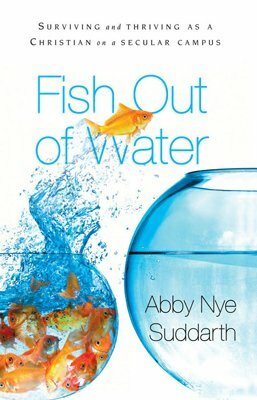 I read Abby Nye’s book on college life with real interest. I believe her evaluation is quite realistic, based on what I have read from secular sources and heard from students on campuses visited since we formed ICR. My last year at Virginia Tech (1969) was the last year of the famous “sixties” youth upheavals, and we had experienced some of those things there, though not as much as others had. Virginia Tech has always been somewhat less “liberal” (politically, that is) than other state universities. Prior to 1970, I had been on the faculties of five secular universities, plus an invited speaker on many others, and so am somewhat familiar with campus life as it was then. Evolutionism was dominant everywhere, even more in the social sciences and humanities than in the natural sciences. Liquor consumption was all but universal, but other drugs relatively rare. The campus religions tended to be quite liberal, but postmodernism was unheard of. Things have surely changed in recent decades. But God had said “For they shall sow the wind, and they shall reap the whirlwind” ( Hosea 8:7 ), and the widespread sowing of evolutionary seed in the 20th century is surely reaping bitter fruit in the 21st. We had anticipated such things would be the eventual result of the ubiquitous teaching of evolutionism in the nation’s colleges and, although I can no longer speak based on firsthand knowledge, these predictions have apparently been coming to pass with a vengeance. Ron Howell, “Defeat Troops, Professor Says; Wants a Million Mogadishus,” Newsday March 28, 2003. “Girls, Pearls, and Indoctrination Machines,” Independent Women’s Forum (January 2000). Laura Schlessinger, “America Is Afraid,” Worldnetdaily.com, Nov. 11, 2002.